I found a great video on grooming your cavalier. 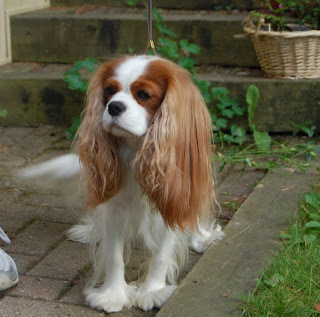 Do you prefer keeping your cavalier with all of his or her natural grown hair, grooming him or her yourself, or bringing him or her to the groomer? Recently, we ran out of dog shampoo, so I used my shampoo. I think that was a mistake. Charlie was scratching all the time, and matting him hair. Sorry Charlie! We recently rewashed him with pet shampoo and he is fine. What shampoo do you use on your dogs? Doesn't it look like Charlie wants to change the channel? I wonder what he would like to watch if he could. Does your dog look at the tv when they are laying with you? Charlie only does when there is something on the tv that looks like a bug. Otherwise, he likes to sleep or play while we are watching tv or reading. Sometimes he is more entertaining then the tv himself! This is a great site for Celebrities who own Cavalier King Charles Spaniels. I think it is great that a Cavalier helped light the Christmas tree one year. Do you know any other fun facts about famous cavaliers? Please add your location, even if you just like looking at Charlie's blog! Thanks. When ever Charlie is asleep on the couch we always seem to cover him with a blanket. My husband calls this "Tucking him in at night". Do you cover your dog in blankets? If you follow our other blog Happy Inspired Home you would know we are moving into a house and renovating it. Charlie has been a great help by being around while we are getting use to our new house. He has already found a few new napping places. He loves the deck outside. Does your cavalier love sitting on decks? We had a great weekend with Charlie. Now back to work this week. This is him in the sun this morning. I have compiled some not so great pet pictures that I have taken of Charlie over the 2 short years that I have had him. Do you take bad pet pictures? Arn't we all very happy about having pets! They always brighten your day! I made charlie into an art piece! I found this software on the internet to make this picture. 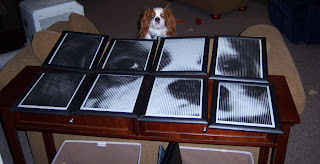 I then added frames and got Charlie art! I think I will hand it over my desk. Here is Charlie checking out his art. Charlie has been shaking his head a lot lately! And it is not because he is saying no. We think he has an ear infection. What do you do for your cavaliers ear infections? Are there different kinds? What should I look for? Charlie does. This is Charlie with the end of the peanut butter jar! This is how Charlie was laying when I came home from lunch. He looks like the sphinx! Charlie waiting for us to let him out! Just kidding! We gave Charlie the empty chocolate container with some food in it. He eventually got it out! Sometimes Charlie gets shy around people and likes to sit on my lap. 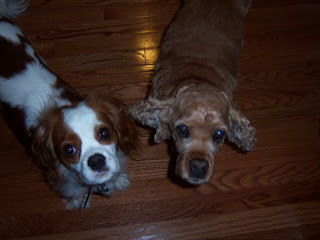 Does your Cavalier like to jump up on your lap? Look at these long beautiful ears. They are much different then Charlies! We have a lot of brushing to do!